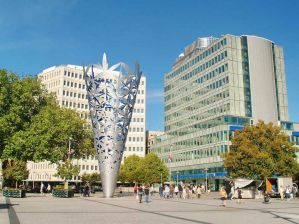 Christchurch is the largest city located on the famous South Island of New Zealand. It sits on the edge of the Canterbury plains and many visitors use it as a jumping off point for exploring the island. Many visitors arrive through the international airport in the city. It is served by many flights throughout the region and is a convenient way to arrive. There are also many domestic flights that arrive in the airport. There is a bus from the airport into the city center. Alternatively, the train station offers trips that are more of a tourist attraction and less functional in nature. The TranzAlpine travels between Christchurch and Greymouth and is a scenic route that many people do as a day trip. The train station is also conveniently located near the Christchurch Botanic Gardens. There are a good number of accommodation options near by and many visitors choose to stay in the area. If you decide to stay further out, Canterbury Shuttles will provide a free transfer from all central city hotels to the Christchurch train station. How much do hostels in Christchurch cost? This hostel offers comfortable modern accommodation for an affordable price. It's a very clean facility with over 30 private rooms including singles, doubles and twin rooms. There are also larger rooms that can be fully booked by families or may serve as dormitories. The style of this hostel makes all travelers feel comfortable, whether they are young backpackers or families. Guests have access to a full kitchen. There's also a coffee bar, bicycles for rent, wi-fi access, and a cinema room. The hostel is within walking distance of many different food options as well as attractions including the railway station, Addington raceway, and the Westpac Centre. It's also very close to Hagley Park and the botanical gardens where you can take a leisurely stroll. If you arrive with a private vehicle, there is free parking available. The staff has travel information available upon request. This hostel is beautifully set in a peaceful environment. It's a lovely place at affordable prices for backpackers. The building dates back to 1871 and was originally the home of a wealthy timber merchant. Today it offers 27 rooms that have been beautifully restored and repainted as of January, 2012. The rooms have a lot of natural light. There are no bunks so they feel more comfortable than your average hostel. There's also a kitchen and laundry facilities available for guest's use. Guests can relax in a lounge that has comfortable couches, a pool table, board games, television, and more. Guest can choose between double rooms, twin rooms, or shared dorms with either four or five beds. The hostel is a short walk from many popular destinations in Christchurch including Hagley Park, Canterbury Museum and Botanic Gardens, the Christchurch Festival, and more. This hostel is eager to help you with all of your travel needs. In particular, visitors who are interested in adrenaline filled sports will find themselves right at home. The staff can help you organize paragliding, whitewater rafting, and sky diving trips. You can also book Lyttelton, Akaroa and Banks Peninsula cruises through the hotel. The hostel was originally created as a boarding hostel for the University. The building is on the heritage list and has a lot of character. There are some subtle inconveniences such as a lack of bathrooms on the first floor where you find most of the bedrooms. There are also facilities available to guests such as a kitchen and lounge. This hostel is a great low cost option for those who are on a tight budget. It's located in a great part of the city center and is near the Arts Center and Botanical Gardens. There are a variety of room types available to guests including bunk beds in dormitories, standard rooms with shared bathrooms, and deluxe rooms with private bathrooms. There are also apartments available that have full kitchens. Other perks available to guests include free off street parking, a dining hall, and a small guest kitchen.